Members of the Chamber of Young Lankan Entrepreneurs (COYLE), recently met President Mahinda Rajapaksa to discuss various issues on the way forward plan for young entrepreneurs and local industries to work on the economic development of Sri Lanka. Assurances were given by the members that COYLE will extend the fullest support to the President in his efforts to make Sri Lanka a conducive market for business, a great attraction for Foreign Direct Investments and a major economic hub in the Asian Region. 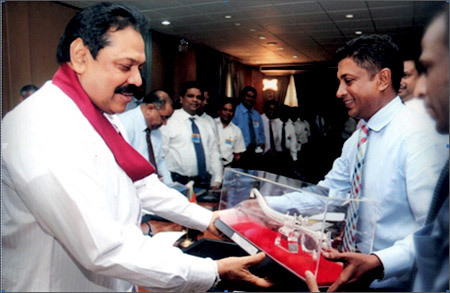 COYLE Deputy Chairman Wasantha de Silva presenting a memento to President Mahinda Rajapaksa. The meeting was held at Temple Trees where COYLE members discussed with the President in detail on the suggestions for the new budget proposal. Secretary to the President Lalith Weeratunga, Treasury Secretary Dr. P.B.Jayasundara, and a few senior government officials also participated at the meeting. The President, gave a patient and attentive hearing to the proposals of the members at the meeting. Entrepreneurs are the people who create wealth to the society and the nation. They are the people who add value to indigenous raw materials and human talents. They create employment opportunities and their contribution to the national economy is substantial. Economic policies conducive to promote entrepreneurs and enterprises should essentially bring positive results to the country and the public, said COYLE Chairman Nayana Dehigama. In highly uncertain market conditions, as individuals the challenges and risks faced by entrepreneurs in the process of wealth creation are enormous. Therefore, an entrepreneurial friendly government is necessarily a high consolation, a blessing and an encouragement for us, he added. Established in 1999, COYLE has a membership of over 125 active members who are young entrepreneurs from different parts of the country representing almost all the industry segments. It is pertinent to mention that President Mahinda Rajapaksa was instrumental in the formation of COYLE 13 years ago, who at that time foresaw the necessity of a body to address the needs of emerging entrepreneurs and local enterprises.